For many colonial powers, the period following World War Two was very hard. After the war, these nations faced crippling debt, austerity, huge damage to infrastructure needing repair and restoration of their exhausted military. Belgium, having been occupied by the Germans since 1940 until late in 1944 was no different. Their colonial possession of Congo was supposed to be decolonialised in keeping with post-war decolonisation efforts. The Belgian Congo (modern-day Democratic Republic of Congo), as a colony, had been very badly treated under Belgian rule. Despite efforts throughout the 1950’s to maintain order, the nation was progressively descending into chaos with major demonstrations in Leopoldville up to independence in June 1960. The neighboring colonies of Ruanda-Urundi (modern day Rwanda and Burundi) were not granted independence until July 1962. Within days of gaining its independence, the country fell rapidly from chaos into anarchy, completely dashing any hopes for an effective self-governed post-colonial nation. Elements of the new Congolese National Army (known as CNA’ or, more correctly, the ‘ANC’ Armee Nationale Congolaise’) mutinied and severe ethnic and tribal violence erupted. The former colonial power of Belgium sent troops primarily to protect white civilians without having sought permission from the new government of the Congo under President Joseph Kasuvubu and his Prime Minister, Patrice Lumumba. This military intervention by Belgium was despite a resolution from the United Nations in July calling for a total withdrawal of Belgian forces. Not long afterward, the southern province of Katanga (with Belgian support) declared independence in July and then the province of South Kasai also seceded in August. Forces from Organisation des Nations Unies au Congo (ONUC), consisting of troops from many UN countries, were supposed to detain any foreign mercenary forces they encountered during their mission. The mining-rich provinces of Katanga and South Kasai (both of which still retained major Belgian mining interests) had been recruiting mainly white mercenaries from South Africa and Rhodesia to assist in their independence efforts. In September 1961, Operation Morthor had been launched by the UN and went badly wrong leading to the Siege of Jadotville where Katangese forces supported by mercenaries fought Irish UN peacekeeping troops, taking numerous prisoner. Perhaps as a result of the failure of the UN involvement and efforts to crush the Katanga revolt, in November 1961, the UN rejected the Katangese claim of independence and finally, fully sided with the government forces. In December 1962, even Belgian support had waned and it finally withdrew support for Katanga. By the end of 1962, the UN and Katangese forces were fighting in the city of Elisabethville. Fighting continued up until the end of January 1963, when the leader of the rebel state Moise Tshombe surrendered at Kolwezi. Despite this, Belgian forces still fought in the Congo on and off until 1978. During their time as a colonial power and following the brokered peace, Belgium left behind military equipment including various armored vehicles. 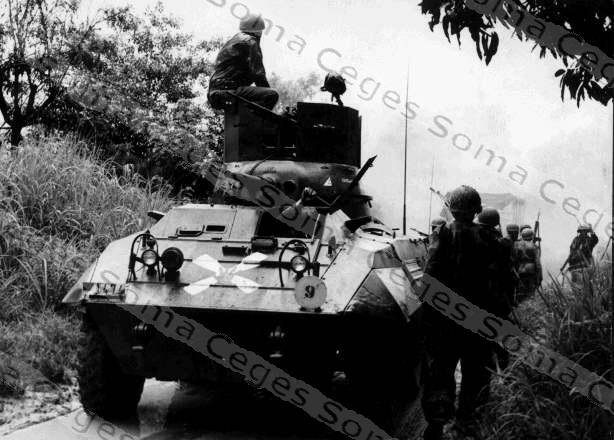 It is not known if the M8 Greyhounds which were eventually used by Katangese forces came directly from these post-colonial stocks or were part of American aid to President Mobutu but wherever they came from they were put to use by the rebels. 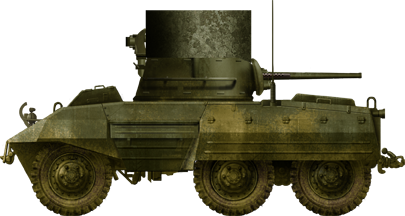 The Armored Car M8 Greyhound was an American vehicle, produced by the Ford Motor Company for the American Military from 1943. It was a 6×6 armored car, powered by a Hercules JXD 6 cylinder 4-cycle inline gasoline engine rated at 110 hp, giving the vehicle a top speed of 55 mph (89 km/h). Main armament of M8 consisted of the 37mm Gun M6, mounted in a fully rotatable turret. There was also a coaxial and box mounted Browning .30 Cal (7.62 mm machine gun, as well as Browning M2 .50 Cal (12.7 mm), mounted on the turret. The crew consisted of four men; commander/loader, gunner, driver and assistant driver. The armoured car remained in service with the US Army until the end of the Second World War, by which time it was considered obsolete. As such it was given to numerous countries as part of military aid schemes. In this capacity, it has served for many years and is still in service with multiple armies worldwide. 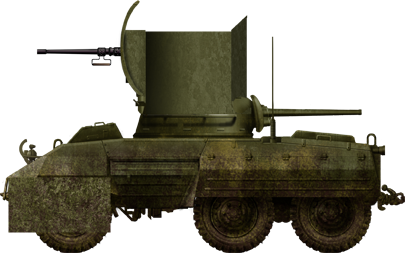 At least two M8 Greyhound armoured cars are known to have been modified for use during this messy and convoluted civil conflict and featured several modifications to the turret. It is highly unlikely that any documented evidence remains as to the work done, by whom, or how much it cost. It is not clear if there was a particular design being followed either. Both designs follow the same principle of raising the turret for improved visibility and mounting the gun as high as possible. 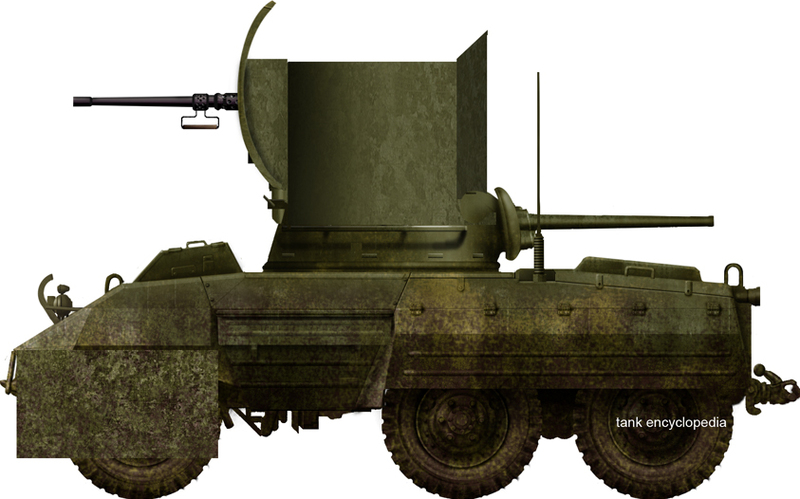 The first type of modified M8 Greyhound featured relatively crude roughly cylindrical addition to the turret roof mounting a heavy machine gun and spot lamp. The vehicle retained the original 37mm gun in the turret. Both the machine gun on top of the turret and the original main gun face in the same direction. Only a single photograph of this vehicle is known to exist which displays the white crosses on the hull signifying it is in the hands of the pro-Katangese forces. The second type of modification was much more extensive. Featuring a much higher cylinder extending the top of the turret, the cylinder actually starts about halfway down the vertical height of the turret where it is wider than at the roof level. It is not clear if the turret retained its hatches. The original machine gun mounting on the back of the turret was retained even though the new weapon did not use it. In the front half of this large vertical cylinder was a large projection with the vertically curved gun shield behind which was mounted a .30 caliber machine gun. This modified turret was so large that it had space for at least two men side by side. The reason for having the new machine gun face in the opposite direction to the main gun is not clear, although the back of this cylinder appears to be mostly open save for large angular plates functioning perhaps as a means of access. Only two types of modifications are known and at least two vehicles can be confirmed to have been made. 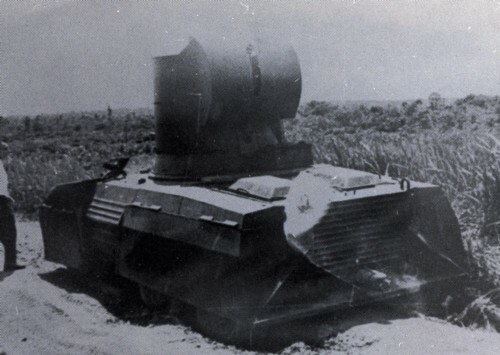 A possible third vehicle is seen in photographs with what appears to be additional armour protection over the front wheels with the same type 2 turret modification. 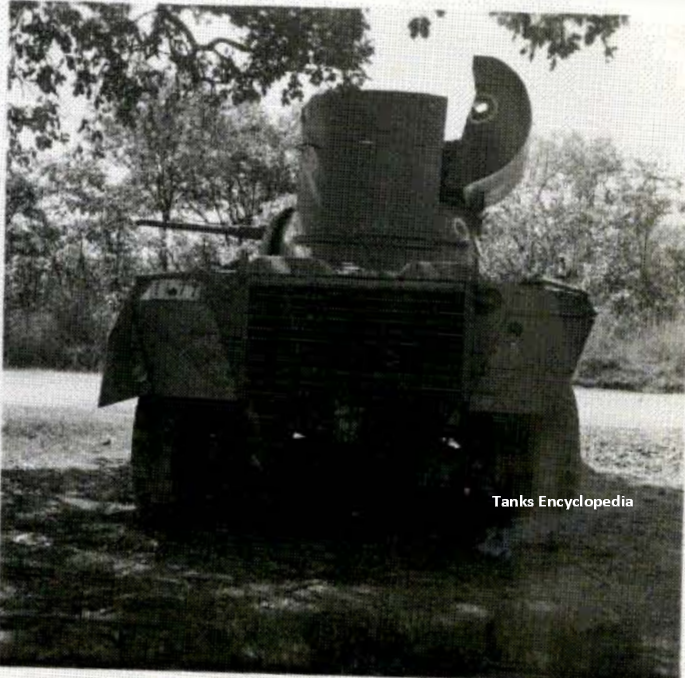 It is likely that this is a different vehicle to the other type 2 turret mounting vehicle which could mean that there were several vehicles modified. Rear of the Katangese M8 Greyhound looking at the left-hand side of the modified turret and another penetration mark (white circle) delivered by ONUC forces. Source: Courtesy of the Archives of the United Nations. Photographic records are very sketchy and there is little documentation to work from. Remarkably, however, despite this, video footage of the second type of Greyhound exists. The footage shows the vehicle being used in combat during the battle for Elisabethville and the very high turret shows its value, allowing the crew to see over the very high hedges in the city to deliver machine gun fire. At least one of Type 2 turreted vehicles is known to have been knocked out after being hit by at least two shells fired by UNOC forces. No records detailing the final fate of any of these modified vehicles which are assumed to have been either scrapped or returned to their original configuration after the war.